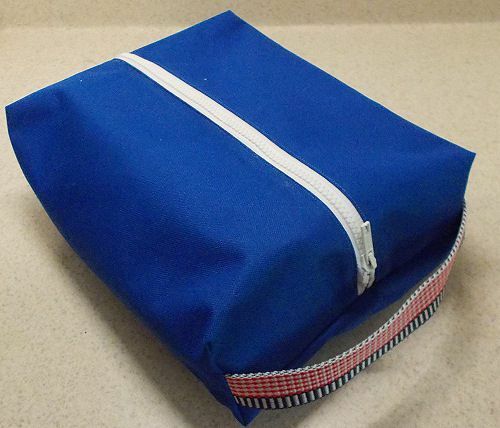 This shoe bag is the perfect way to keep your shoes packed with your clothing but maintain keeping your clothes clean. This bag is also a perfect size for keeping your craft projects at hand for hand sewing or other crafts. Use production sewing methods to mass produce this bag so you have one for every pair of shoes, and for a quick way to grab a project to work on while you are on vacation, laid up or just waiting for your next appointment. This bag fits nicely under car seats so you have a project on hand if you are "stuck" waiting with nothing to do! 14" zipper: An all-purpose or heavier duty zipper depending on the demand you intend to put on the bag. 2 15" by 13" pieces of heavy duty or upholstery fabric. This is a great project to use up upholstery fabric samples. Place the zipper, pull side down, on the right side of a 15" edge. Align the edge of the zipper tape with the 15" edge of the fabric. Pin or baste in place if desired. 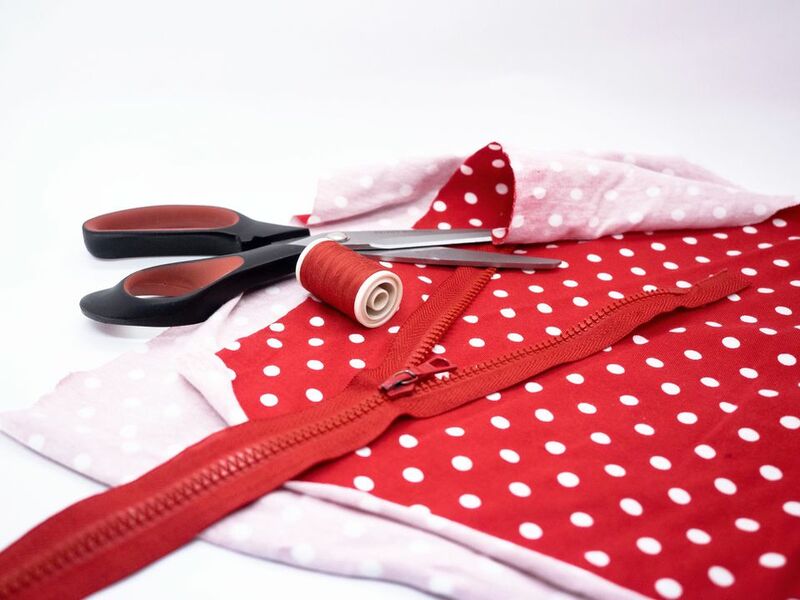 Sew the zipper to the fabric using a 1/4" seam allowance. Line up the second side of the zipper and the fabric and repeat the procedure you did to sew the first half of the zipper. Press the seam allowance back under the zipper. Top stitch the seam allowance under the zipper by sewing as close to the folded fabric edge as possible. Using the needle position on your sewing machine assists in placing the stitching as close to the edge as possible. Bring the remaining 15" edges of fabric together, aligning the edges. Sew a seam using a 1/4" seam allowance. Sew a seam finish on the seam allowance. Press the seam flat and to one side. Starting on the open end of the zipper with the zipper closed, place the center of the zipper over the center of the side seam. Sew an end seam using a 1/4" seam allowance. Open the zipper so you will be able to turn it right side out. Line up the remaining end the seam way you did the first end and sew using a 1/4" seam allowance. Apply these steps to the end of the bag where the end of the zipper is closed. Finger press or mark the fold at the side of the bag. This is a temporary mark. (This is a great time to use a ​wooden pressing bar). Lay the end seam over the temporarily marked side fold. Measure 1 1/2" up from the corner and mark straight across the seam as shown in the photo. This mark is the seam line that you will be sewing on. Trim the triangle off leaving a 1/4" seam allowance. Apply a seam finish to the raw edges. Follow these steps for the end of the bag that the zipper opens. Finger press or mark the fold at the side of the bag. This is a temporary mark. Pin the end in place. Trim off the triangle leaving a 1/4" seam allowance. From inside the bag, bring an end of the webbing, keeping the webbing straight, through each seam allowance and pin in place. Sew the seam by sewing across the marked line as you did the previous end. Sew a seam finish on each raw edge.